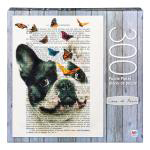 This 300-piece puzzle features unique art by designer and illustrator Coco de Paris. The artwork borders on the bizarre, but is certainly surreal and intriguing at the same time. This puzzle features a cute bulldog surrounded by a kaleidoscope of colorful butterflies. The Milton Bradley line of Cardinal puzzles are manufactured on high-quality cardboard and come with an easel for displaying the box and resealable bags for storing your puzzle pieces. Measures 24" x 18" when complete.